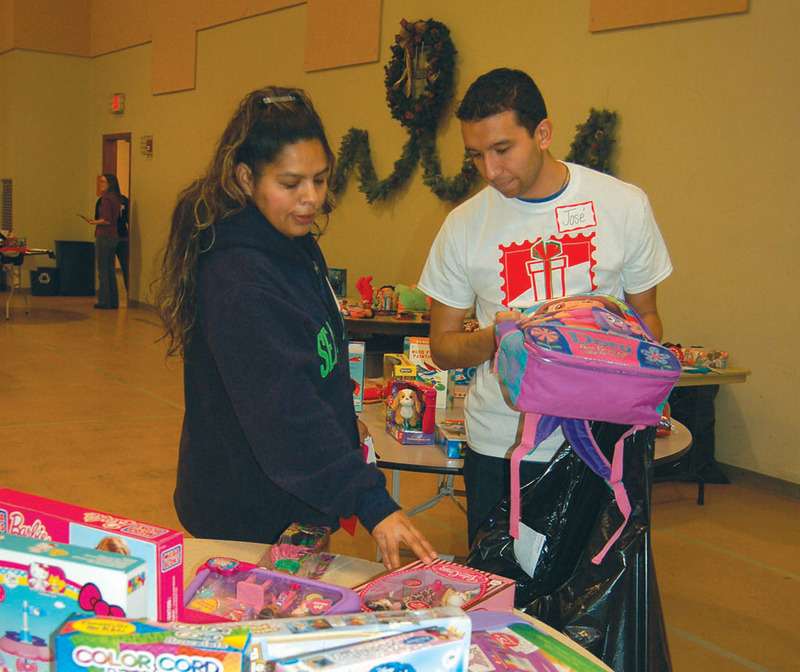 In the spring—when Christmas is the last thing on most people’s minds—the committee that organizes the Puente del Pueblo Christmas store holds its first meeting. The truth is, between the midwinter debriefing, the spring/summer planning, and the fall/winter collecting, sorting, and preparing, it is nearly always “Christmas store season” for those behind the scenes. With the event still half a year away, the team is already planning for the two hundred families—households that represent a total of approximately five hundred children—plus the hundred and fifty volunteers needed to make the store a reality. Built on a proven and well-respected model that meets the clients’ deeply felt needs to provide for their own families while maintaining their dignity, the store is a logistical masterpiece—allowing parents and grandparents to select the gifts and to participate financially in a meaningful but affordable way. Each gift, all of which are donated, is given a price—a fraction of the actual cost—that is within a typical client’s limited budget. Then the funds that are received from shoppers are invested in Puente programs serving their own community, especially the client-assistance fund, which is used to stabilize families’ housing and utilities in times of crisis. 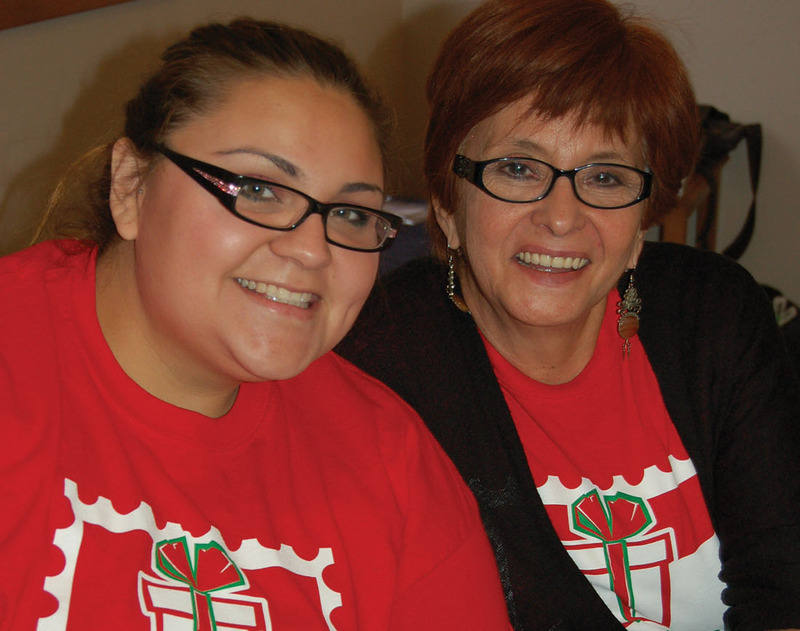 Puente staffers, Rosie and Irene, greet every shopper. While the planning and preparations continue nearly year-round, it is equally true that the impact of the store on the lives of West Chicago families extends far beyond the early-December Saturday when the store is “open for business.” The circumstances that bring parents to the store are building up for months, if not years before. And the ways the lives of families in the community are touched by their experiences with the Christmas store continue to ripple through their lives long after their shopping day. Coming to the Puente Christmas store for the first time in 2013, Tayde was there to shop for a granddaughter who lives in her home. Observing the many volunteers working that day, she was struck by their joy in serving the community—service she understood as coming to and from the Lord. She also observed the excitement of her fellow shoppers and their joy in being able to provide a gift for each of their children who otherwise might have gone without. personal Savior. Early last year she prayed to give her life to God, and on November 8, 2014, she was baptized during the All-Church Spanish/English Baptism Celebration. Today she is a faithful attender at Iglesia del Pueblo. Just some of the volunteers who make the Christmas store possible. This past Christmas, Tayde was back for her second year as a shopper—but at noon, when the volunteer shift changed, she traded her shopper’s badge for a volunteer T-shirt and spent the afternoon helping other clients! For Tayde, the Christmas store was an event that rippled out through every month of the year. Another shopper whose journey to and from the Christmas store spans all seasons is a mom we’ll call Juana. She shares a one-bedroom apartment with her husband and five children. Her family has difficulty paying the rent. Her husband treats her badly and spends what little money they have on alcohol, yet Juana is unable to support her children on her own because her husband will not allow her to keep a job. For that reason, she has been unable to build skills, experience, or a résumé. Because her husband had forbidden her to leave the apartment, she visited the Puente office one day while he was at work. There, staff member Rosie Delgado told her about the Christmas store and helped her make an appointment. When Juana came to the store, she was able to buy a gift for each of her children. She was touched by the volunteers who reached out to her, and was impacted by their loving hearts. Invited to an Iglesia del Pueblo Christmas event, she attended with her five children, sitting in a back pew. She loved it! Though her ability to leave her apartment is very limited, through Rosie and the Christmas store, Juana has a new awareness of Christian community. A few days before the store is open, the parents who have been invited call Puente’s office to make a shopping appointment. Many Christmas “charity” events operate on a first-come, first-served basis, and parents may stand outside in the cold and snow for hours, attempting to gain a place in line. The Puente Christmas store intentionally follows a different pattern—one that allows the Body of Christ to ascribe dignity and honor to each of the shoppers. After the gifts are selected, each one is wrapped by volunteers and ready for Christmas morning. A predetermined number of appointments (about sixteen this past year) are made for each half hour, and gifts are planned, sorted, and set out accordingly. In that way, an appropriate number of items, by age group, are available to be perused at 3:00 in the afternoon, just as at 9:00 in the morning. On the day of the store, shoppers come at their appointed times and are paired with a helper. Then they have the opportunity to purchase a fixed number of gifts for each child they registered. This is generally a great experience for both shopper and volunteer because so much friendly interaction happens between the two. And sometimes, it can feel like a miracle! That was the case for Gabi, who had only $30 to shop for her five children when she arrived at her appointment. She was anxious and worried—concerned that her money could not possibly stretch enough to cover one Christmas gift for each child. As she shopped, she asked about the price of each item, carefully calculating the total in her head. When she had chosen something for everyone, she was amazed that her total was $27.50—just what she had, with a little change left over. Tears came to her eyes as she expressed how shocked and relieved she was. Alejandro, volunteering with his wife and daughter for the second year in a row, was Gabi’s helper. He saw firsthand her excitement at being able to afford gifts for all five children. The experience of walking through the morning with Gabi moved Alejandro greatly. Realizing the impact the store has on families, Alejandro is inspired—and wants to inspire others—to plan ahead and save money each month so that in December, nice, quality gifts can be purchased and donated for the store. After paying for their selections, clients move on to one of the most important parts of the day, when volunteers wrap the gifts that have been selected, while the shoppers enjoy refreshments in the hospitality room. Bill, Blanca, and others spent the day volunteering in the hospitality room. They see their role as one of the main treasures of the store because they interact with nearly everyone as the hours go by. These volunteers are on the lookout for opportunities to serve the shoppers—men and women who themselves are so often serving and so rarely served. A shopping helper aids each guest, helping find just the right gift. As Blanca offers coffee and cookies, she talks with the shoppers, hears their stories, and answers their questions. She and Bill ask them about their hopes for the future or about their personal concerns. As they listen, they offer to pray with the shoppers, and many accept those offers. They also invite them to attend church services over the holidays. As the hospitality volunteers help the shoppers process their experience and share about themselves, they find the shoppers grateful, overwhelmed by the eagerness and love they see in those who helped them through the day. They experience the truth that the Christian call is one to love and serve. Several weeks later, when gifts purchased at the Puente store are pulled out of hiding and placed under the tree, parents and grandparents remember where those gifts came from. And months later, when a family decides to visit the church, that decision may be the result of a seed that was planted during their visit to the store. When a crisis arises and they remember the people they met at Christmastime, they often turn to Puente del Pueblo for help and support. When Alberto came to Puente’s office last year seeking assistance with a problem, he told the staff that he first learned of Puente at the Christmas store in 2013. He shared that it is difficult to provide even small gifts for his family each Christmas, because any money spent on gifts must come out of funds designated for rent, food, or utilities. “It was a great help to buy good gifts for my children with my $20. I was able to buy cars and trains for them at the Puente store,” he said. For Anna and other volunteers, helping with the store is an opportunity for the seed of service to grow in their lives and for them to experience what it means to see God use them as His hands and feet and make a difference in real lives. 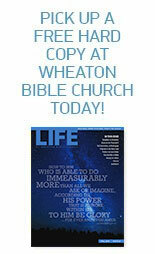 This entry was posted on April 1, 2015 by Wheaton Bible Church in Spring/Summer 2015.